Can you imagine one day showing up at school only to find out that your teacher for that day would be an experimental humanoid robot? 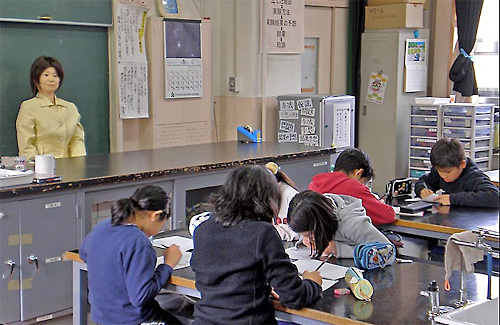 Well that’s exactly what happened to a group of kids at a school in Tokyo recently when “SAYA”, a robot who started life as a receptionist was introduced to them as their teacher by researchers with one of the primary aims being to instill an interest in science and technology on their young impressionable minds. The robot, designed and developed by Professor Hiroshi Kobayashi and other professors at the Tokyo University of Science who insist that Saya who has no ability to learn is not meant to replace human teachers (yea right! ), just to highlight the joys of technology. Saya however has over 3o moving parts, can display emotion, can relay orders via speech and she is controlled via remote control. Saya’s name comes from the Malay language and means “I”. There we were thinking that only menial tasks like war and lifting heavy loads would be taken over by robots but now we are realizing that even teachers are in danger! Conspiracy theorists unite! – this is the second clue in 2 weeks, just last week I saw a robot as a bike riding traffic cop when I watched Star Trek at the theater. I expect more clues when the new Terminator movie opens in a few weeks. Agreed. We’re all boned. Time to stock up on instant noodles and Twinkies! They will kill us one day… I’m sure of it.. or will start teaching kids wrog things.. like hidden programming!!!! Not surprising for Japan !!! first comes the robots….next ZOMBIES~! !